The former boss of one of Britain’s biggest energy suppliers has warned that the safety buffer separating Britain from power cuts will be uncomfortably slim for up to four years. 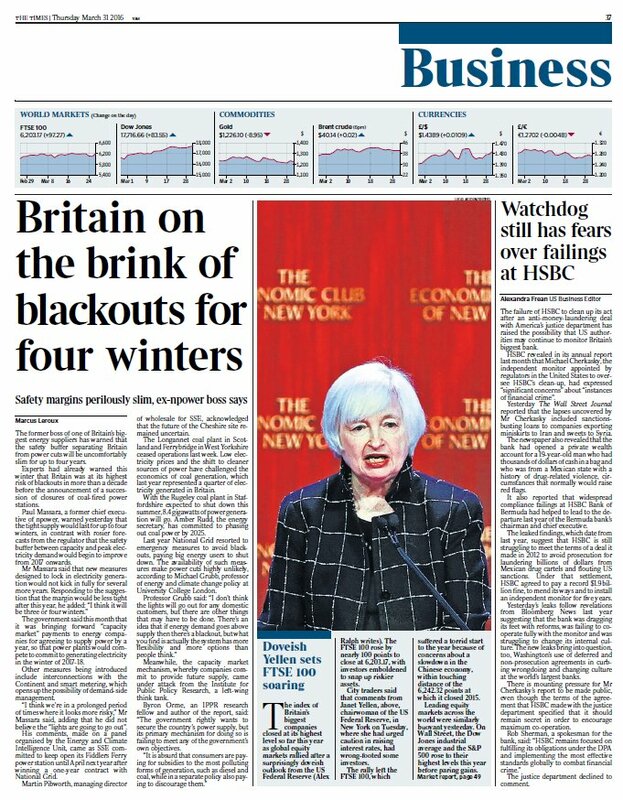 Experts had already warned this winter that Britain was at its highest risk of blackouts in more than a decade before the announcement of a succession of closures of coal-fired power stations. Paul Massara, a former chief executive of npower, warned yesterday that the tight supply would last for up to four winters, in contrast with rosier forecasts from the regulator that the safety buffer between capacity and peak electricity demand would begin to improve from 2017 onwards. The government said this month that it was bringing forward “capacity market” payments to energy companies for agreeing to supply power by a year, so that power plants would compete to commit to generating electricity in the winter of 2017-18.